Granite – Maintenance, Upkeep and a Geiger Counter? You are here: Home / Myth or Misconception / Granite – Maintenance, Upkeep and a Geiger Counter? 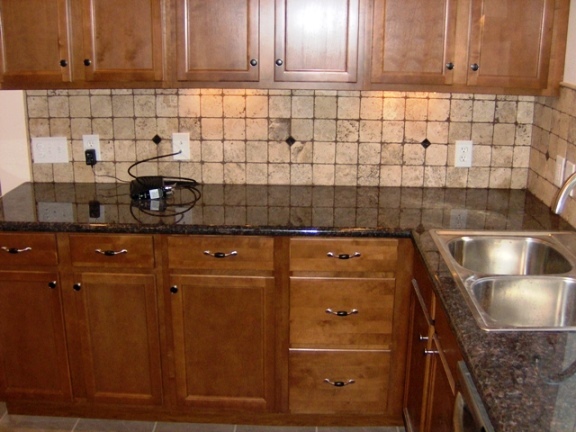 Besides laminates, granite is one of the most popular materials around for countertops. What isn’t there to love about it? It is a durable product that can last for centuries. It can easily handle a hot pan being placed on it. It does not chip or scratch easily, and no one else will have one exactly like yours, as it is a product of nature. Unbelievably, there are over 900 different types of granite available for purchase in the US. With so many choices available and its simple durability it is no wonder than many people select it when building a new house or getting their kitchen remodeled. Do I need to seal my Granite Countertop and how often? In most cases, trying to seal your granite countertop will not be worth your time or the money spent because the granite is so dense it will not accept the sealer. Please notice I said in most cases, so how do you tell? Well you can perform a simple two-part test to find out if it needs to be sealed or not. If the granite did not darken up or absorb any of the water or oil, you can move onto the next section. If it did darken up you will need to seal the countertop. Relax the oil and water spot will lighten and disappear in approx 20 to 30 minutes and will not hurt the stone. Based on the sealer purchased or installed along with the use will depend on how often it needs to be reapplied. Some DIY products will need to be re-applied every 6 months while some professionally installed products may last up to 15 years. Talk about easy, simply wipe up any spills immediately, clean the countertops with a mild soap, wipe it down with a clean damp cloth, and then dry with a soft dishtowel. Man, this is great, I can slide my hot pans directly off the stove off on it, I can slice and dice on it, this stuff sounds bulletproof. Well, let us take a quick step back and use a little common sense. If sealed properly, granite is impervious to staining and etching – FALSE, granite is still a porous substance and can still be stained or etched. Depending on the type of stain will determine what type of treatment is required. Most stains can be cleaned up using a poultice. A poultice is to reabsorb the stain from inside the stone out, into something that is more absorbent than the stone itself. A poultice is composed of two components: A chemical that will interact with the type of stain at hand and an absorbing medium to reabsorb the stain out of the stone. Before you start to make the poultice, you should pre-wet the area with distilled water. This will fill in the pours and helps isolate the stain aiding in its removal. To make a poultice, mix your absorber and reactant to form a paste about the consistency of peanut butter. You then simply apply the paste over the stain (approx. 1/2″ wider that the stain itself) leaving it a good 1/4″ thick or better. In some cases you can use a folded up paper-towel as the absorbent, just put the soaked “pillow” over the stain. In either case, you should cover the poultice with plastic wrap and tape it down. This helps prevent the reactant from evaporating because the object is for the reactant to soak into the stone and attack the chemicals that created the stain. You should leave the poultice on for 24 – 48 hours then remove the plastic wrap. Let your poultice dry out completely by removing the plastic wrap and allow the reactant to be reabsorbed into the absorbent. When everything has completely dried out, remove the poultice, rinse the area and let it dry. In most cases, you will see that the stain is gone, if not repeat the procedure step by step again. Once the stains are fully removed, you should apply a good-quality sealer to your countertop. Poultice made with baking soda and water or mineral spirits. Why isn’t granite the top countertop choice then? There has to be a catch though, right? Well, there are four general reasons why people do not go with granite. The first two main reasons deal with the cost and they just might not like the look or want something different from what the Joneses have. The third reason is that it is a porous substance, which we covered above and choose to go with a non-porous surface. The fourth reason popped up a few years ago and it has to deal with it being a natural product that can contain minerals like Uranium, which are radioactive. I can hear it now, oh great, now I need to get some funny suited character in here with a Geiger counter, right? Well, I am going to skip over the fruitcakes out there that say every kitchen is another Chernobyl or 3 Mile Island waiting to happen and simply just go with the facts. First off, radiation is a natural occurrence and most types will not hurt you. Granite is simply a naturally radioactive material due to some of the minerals that compose it. For example, talking on your cell phone, watching TV, walking outside, etc… will have exposed you certain types and different levels off radiation. A Geiger counter may tell you that radiation is present but not what types and if you should be concerned. Should you be worried? Based off most published studies and experts – the answer is no. The first resource that has a lot of data available on this subject is from the Marble Institute of America. The second one not affiliated with any group that sells granite or a competing product would be the Environmental Protection Agency. If you are worried about the granite in your house, I would recommend getting a simple radon test done to see if there is any cause for concern.